Man’s best friends may soon have their very own slice of the great outdoors in the heart of New Orleans. A new nonprofit, NOLA City Bark, is marshalling support for the city’s first official dog park to be established within City Park as a haven for dog owners to bring their pets for some off-leash fun and exercise. The park is being planned for a 4.6-acre site behind Popp Fountain, near Interstate 610. With a $500,000 fund raising campaign now under way, City Bark directors hope construction will begin this spring. Jackie Shreves, founder of NOLA City Bark and a board member of both City Park and the LA/SPCA, says dogs aren’t the only ones who could benefit from the new attraction. Shreves hopes the new dog park could also rejuvenate a section of City Park that’s now used only rarely, while giving residents another new quality-of-life amenity in their park. “We started doing research on parks around the country and I could hardly find another city that didn’t have a dog park already. I realized we were really behind the times on this,” she says. One silver lining is that City Bark can benefit from the best practices of other such facilities and learn from their experiences. As a result, the City Bark plan calls for annual permit fees paid by dog owners to allow entry. The permits, issued by veterinarians and the LA/SPCA, would simultaneously provide operating revenue for City Park to maintain the dog park and create a system for ensuring dogs using the park are up to date on vaccinations. The site already has a shelter with restrooms and some planned dog park improvements include walking paths and benches, dog drinking fountains and wash stations and separate areas for large and small breeds. Shreves says fencing will be erected in a round pattern so that the perimeter contains no square angles where dogs can feel cornered and become defensive. “Hopefully, people will be coming here some day to model future dog parks after ours,” says Shreves. 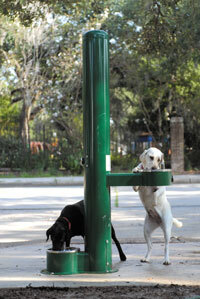 City Bark plans to present detailed plans for the dog park this month. To get involved, go to www.citybark.org.